Rudy Hatfield To Play Again For Ginebra? Will He Be Able To Energize Ginebra In The Philippine Cup? The Barangay Ginebra Gin Kings have been showing some signs of inconsistency and lack of intensity in the PBA Season 37 Philippine Cup. What's worst for them is that their 2 new acquisitions, namely The Kite Rico Maierhoffer and The inaugural PBA D-League MVP Allein Maliksi are injured. The what could have been the new sources of energy for Ginebra are out. The question now for them is, where can they get the energy and the hustle that they need in order for them to effectively contend for a Title against tougher Teams? That has been the hanging question for the Gin Kings. 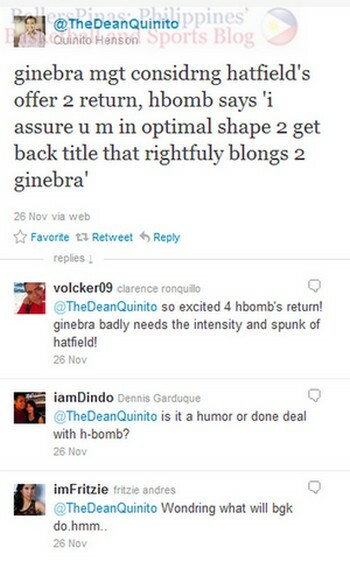 But a few days ago, a Tweet coming from an institution in the Philippine Basketball, Mr. Quinito Henson could well be the answer to that long standing Question. Tigas naman ng mukha nito kung babalik pa. This might be the third time he be doing this crap. Ano yun? pag wala kang makuhang trabahong maayos sa US magalaro ka ulit dito? It only shows how FILIPINO he really is. That is if you catch my drift.